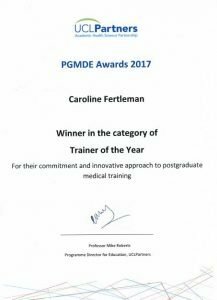 We are a 22 individual doctors and medical students who wish to collectively nominate Dr Caroline Fertleman for Trainer of the Year Award. Caroline’s passion for medical education is infectious, particularly her ability to turn any situation into a chance to learn. She is very proactive about sharing learning and engaging people and not only provides a great deal of excellent teaching herself but also inspires others to pursue their interest in medical education. Caroline shows exemplary personal support to trainees; valuing their hard work, recognising their talents and caring about their wellbeing. Her on-going support has had a profoundly positive impact on many trainees, including her work with trainees in difficulty. She is brilliant at offering opportunities to people, supporting them in pursuing new ideas and introducing those with common interests who could work well together. Through recognising the strengths of trainees and empowering them she not only is a fantastic role model but has created a new generation of medical education leaders. Caroline’s unique and engaging style as a trainer inspires others not to be afraid to bring their own personalities to their work as medical educators and she is very open-minded and inclusive, celebrating differences and working with a huge variety of people across different professions (her recent work for midwives and nurses on learning to support people making the transition to parenthood being an inspiring recent example). She is innovative and creative when it comes to providing new education programmes and opportunities for paediatric trainees. For example, she guided the development of the MRCPCH clinical revision website – the videos of which have been viewed over 3 million times. She also led on the London delivery of the ALSG “Child Protection: Recognition and Response” including faculty training and has developed innovative training on Child Sexual Abuse. She was awarded The Presidents Medal 2016 from the Academy of Medical Educators in recognition of her “exceptional and sustained contribution to medical education”. She has published large number of different articles in major journals on issues surrounding training and supporting trainees as well as many medical education publications. She is senior author of three textbooks for trainees; The Child Protection Practice Manual (Oxford University Press 2016), Learning from Paediatric Patient Journeys: What Children and Their Families Can Tell Us (CRC press 2016) and Hands-on Guide to Practical Paediatrics (Wiley-Blackwell 2014). Her Hand-on Guide text was the Winner of the Paediatrics Category at the 2015 BMJ Book Awards. Caroline recently organised the “Women of the Whittington” conference for female doctors and medical students, which was enormously well received and had fantastic feedback from attendees. She is also involved in the Passion for Paediatrics conference for trainees, designed to help bring the joy back to work for paediatricians in recognition of the low morale amongst junior doctors. 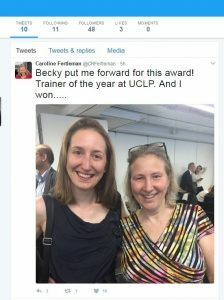 Caroline is an inspiration, a trainer and a mentor to so many junior doctors and medical students and we would love for her to receive recognition with a UCLP award.